Romantic three course dinner or indulge with a "Wine, Dine and Sparkle" experience! Celebrate Valentine’s week with a three-course prix fixe menu featuring an 8-oz. 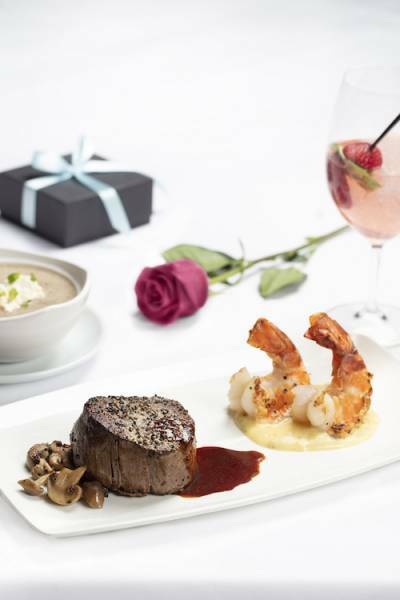 filet mignon paired with choice of colossal shrimp or North Atlantic lobster tail ($20 supplement). Dinner includes caviar blini amuse bouche followed by either mushroom bisque or beet salad. End on a sweet note with white chocolate bread pudding with raspberry champagne sauce. Or enhance your dinner with a luxurious “Wine, Dine & Sparkle” experience which includes dinner for two, a glass or bottle of Moët & Chandon Brut Imperial Champagne or Dom Pérignon Brut Champagne and an exquisite gift from a luxury Fifth Avenue jeweler, at three different tiers. For the Wine, Dine & Sparkle experience, please email flemingsreservations@tilsonpr.com or call 561-922-7377. Fleming’s full à la carte menu will be available.